Call 506-300-0477 to get on the calendar. price varies based on guides, location, and hunter goals. All inclusive hunts start at US $4,995. Zone selected at time of license purchase and based on pre-season scouting. 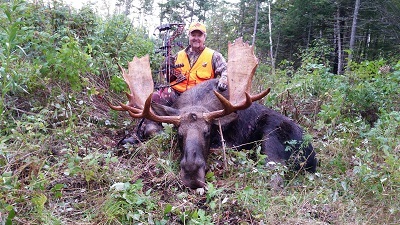 Trophy quality hunts hosted by OMM Outfitters at the lodges of New Brunswick's top outfitters in hunting areas known for trophy quality moose. The hunter and trophy quality experience is much like what is available in nearby Maine. Hunts are superior to the hunts offered by Quebec over-the-counter tags and expect the animal and antler size to be larger than offered in Newfoundland. Local guides are well trained and know how to get close and personal with these magnificent animals.